Picking a new motherboard for your gaming build can be a tough nut to crack. In the world of awesome looking motherboards with extreme performance, choices often seem hard to make. However, dig a little deeper and you’ll reward yourself for learning more about true gaming motherboards and the ones that claim to be. 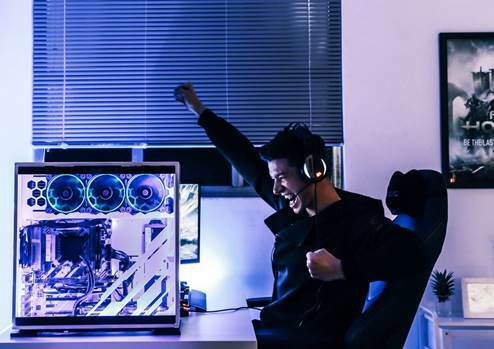 Don’t settle for less, maximize your gaming experience! See how the X370 GAMING M7 ACK does just that for you. The lowest latency online gaming experience is most important when playing multiplayer games. Some brands use basic network solutions with no network optimization, however the X370 GAMING M7 ACK comes with the best in the business to offer a feature packed, no-hassle lowest latency gaming experience called Killer™ LAN. Designed with gaming DNA, Killer™ LAN is optimized for championship level online and LAN eSports. The Killer E2500 Intelligent Networking Platform, featuring Advanced Stream Detect 2.0, is built to provide maximum networking performance for online games and high-quality streaming media. Killer™ LAN automatically detects and prioritizes game traffic ahead of other network traffic for smoother, stutter-free in-game performance and a competitive edge. While gamers mostly use LAN ports for gaming, it can also happen WIFI needs to be used to play games. Killer™ Wireless-AC 1535 with ExtremeRange™ Technology delivers industry-leading speed, intelligence and control for PCs. 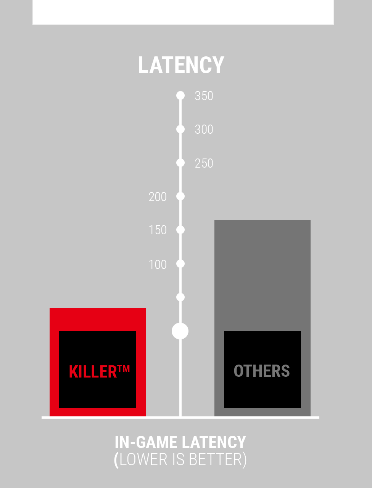 Killer’s Lag and Latency ReductionTM Technology combined with Killer’s ExtremeRange™ Technology revolutionizes the user experience by driving better throughput, lower latencies, and longer WiFi ranges. Play your game, stream your game, and enjoy your HD video – all at the same time and uninterrupted. You can even team them up! The Killer™ Ethernet connector and the Killer™ Wi-Fi adapter can actually work together for the ultimate high speed attack, this is called Killer™ DoubleShot. This means you can have the best online gaming experience by making your Killer LAN dedicated to game traffic, while Killer WIFI takes care of all other applications on your system using up internet resources. You can do this manually or automatically using the bundled Killer Network Manager. Combining LAN with WIFI also upgrades your total network speed to give a max throughput as high as 1.867 Gbps. Super-fast loading times. M2 Shield FROZR powered M.2 slots have you covered. Everyone wants low loading times and a fast responding PC. Mostly used for this are NVMe based SSDs. 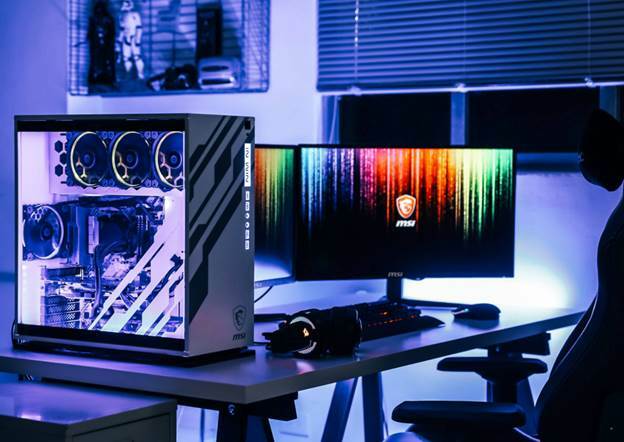 However, especially when using these SSDs for a few hours or more, they become hot and start to lower performance to lower its temperature, which causes system slowdowns. 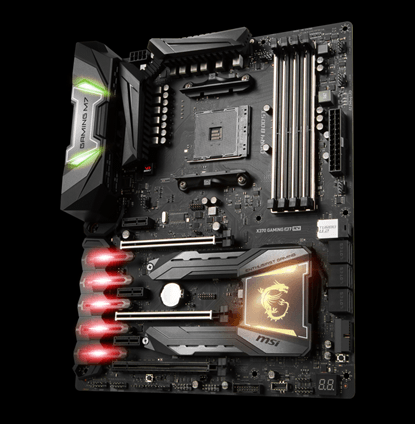 To prevent this, even during the longest gaming sessions, we included M.2 Shield FROZR, a built-in M.2 thermal solution, on the X370 GAMING M7 ACK motherboard. Two M.2 Shield heatsinks are connected to the motherboards’ PCH heatsink which features its same thickness and robustness as well as great cooling capabilities. 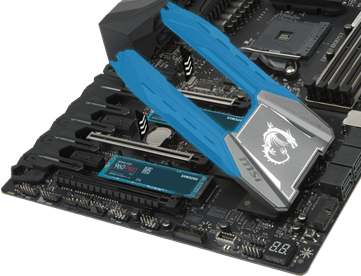 With M.2 Shield FROZR you never have to worry about your PCI-Express based M.2 SSD to start throttling, lowering down performance. On top of that, M.2 Shield FROZR also support Intel® Optane Memory. Gain an in-game advantage by using premium sound with clever features. Use the premium design of Audio Boost 4 and its high quality components to get a more immersive sound experience and find your enemies location with pin-point accuracy with the help of crisp clear sound alone. How? Audio Boost 4’s design is completely isolated from the rest of the motherboard to prevent interference and uses separate PCB layers for left and right sound. Audio Boost 4 also uses industries highest quality components, specifically designed for audio application, such as a Realtek 1220 HD Audio Processor, Chemi Con audio capacitors and a dedicated (headphone) amplifier. All of this combined offers the purest and crystal clear sound experience you expect from a premium dedicated sound card. On top of that, to offer an even better surround sound experience, Audio Boost 4 exclusively comes with Nahimic 2+ Sound Enhancer software. This software further enhances the surround sound experience and offers unique gaming features such as Sound Tracker. Audio Boost 4 with Nahimic not only gives you a great advantage when gaming, it also offers you a more enjoyable and more immersive listening experience. The X370 GAMING M7 wouldn’t be complete without customization options. Serving PC enthusiasts and modders around the world, MYSTIC LIGHT RGB is present on the M7’s heatsinks and covers. With 16.8 million colors and 17 LED effects to be completely customized, there’s more personalization to be enjoyed.